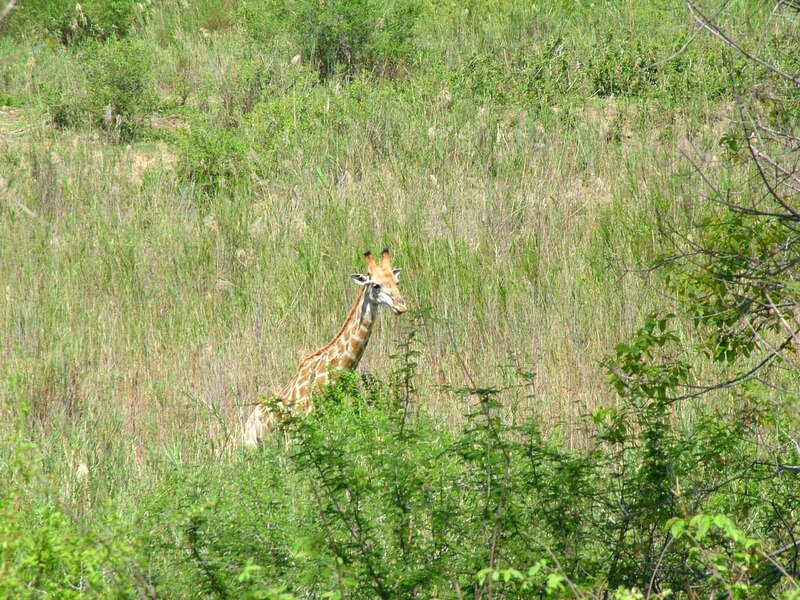 Our long-anticipated arrival at Kruger National Park was like a dream come true. This journey, for me, had its roots tied to historical accounts of explorers Dr. David Livingstone and Sir Henry Stanley and their exploits on the Dark Continent. Add to that a detailed look at Kenya in one of my high school science projects, and a life-long passion to travel to the deep, dark “jungles” of Africa was born. 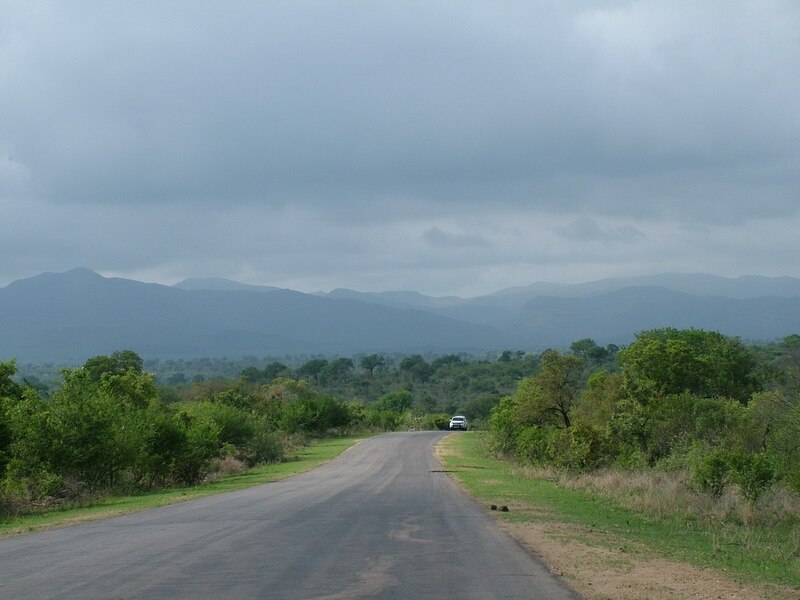 Travel to the sub-Saharan region of the continent personified my imaginings of an exhilarating trip complete with risk, daring, incomparable wildlife adventures and unique landscape. We had to conquer our fears and fan the flames of our adventurous spirit. As we entered through the Phabeni Gate, our excitement was palpable even though I was withstanding a bout of stomach and intestinal infection that had arisen that afternoon. 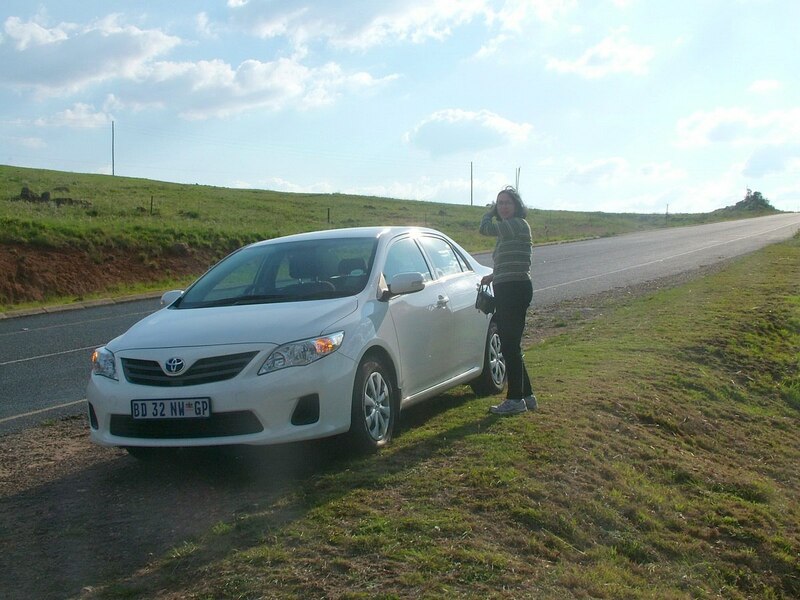 Our trip to Kruger National Park began after we finished sightseeing at the Three Rondavels in Blyde River Canyon north of Sabie. We had rented a car at the O.R. Tambo International Airport in Johannesburg upon our arrival in South Africa, and Bob handily navigated the roadways as we toured the countryside. 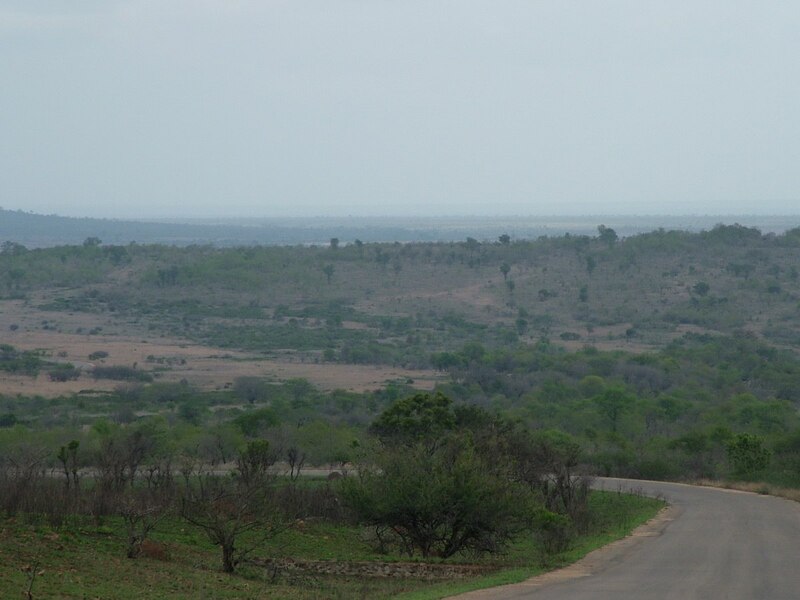 We made several stops en route to Kruger National Park because the landscape was both interesting and beautiful. 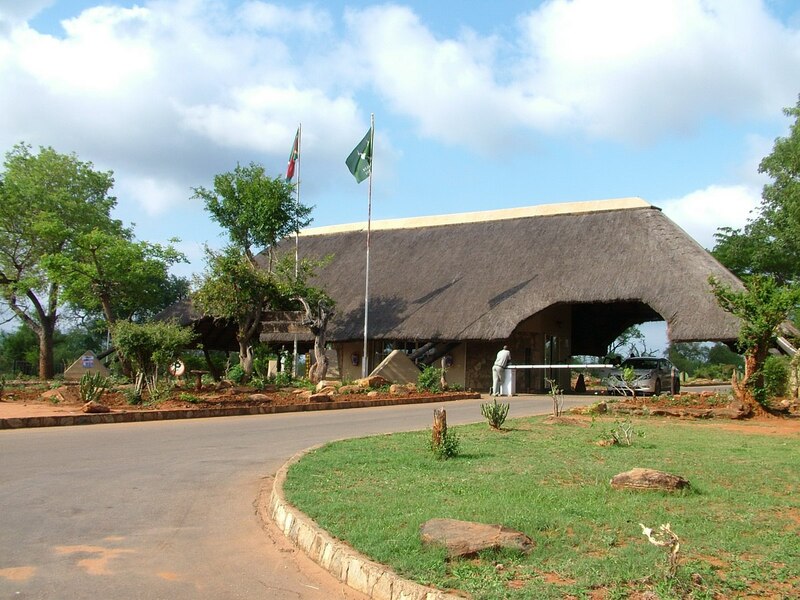 Our destination, at the end of the day, would be Skukuza Rest Camp, and the nearest gate into the Park and within striking distance of the rest camp was Phabeni Gate along Hwy. 536. Both it and the protective gate at Skukuza close daily at 6:30 p.m.
We left the Three Rondavels behind at noon, and Bob wasted no time motoring along. When we stopped for photos, no concern crossed our minds as to possible danger from wild animals…not there along a major highway. 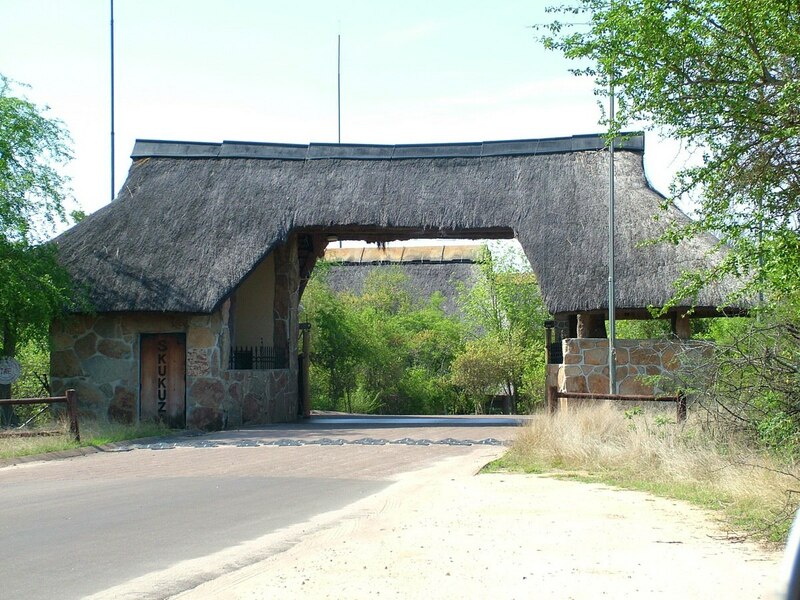 The same could not be said once we passed through the Phabeni Gate into the world famous game reserve. As I beat it to the facilities at the Park entrance, Bob was given strict instructions from the Park attendants that at no point whatsoever were visitors to exit their cars unless they found themselves within the confines of one of the fenced rest camps. The road stretched before us, I felt deplorable, but still anticipation was right up there with the clouds. When once I had to throw up, Bob said to stick my head out the window of the car (after he pulled to the side of the road, of course), and I thought, be damned if a leopard will rip my head off as I puke. I opened the door a crack and left deposits on the sandy earth below the car. We were so wrapped up taking in the landscape that it helped to distract me from my affliction. Skukuza Camp was a good hour and a half inside the Park, and already, our eyes were seeking any movement that might indicate some animal amongst the vegetation of the savanna. It still came as a huge surprise when we experienced our first wildlife sighting. 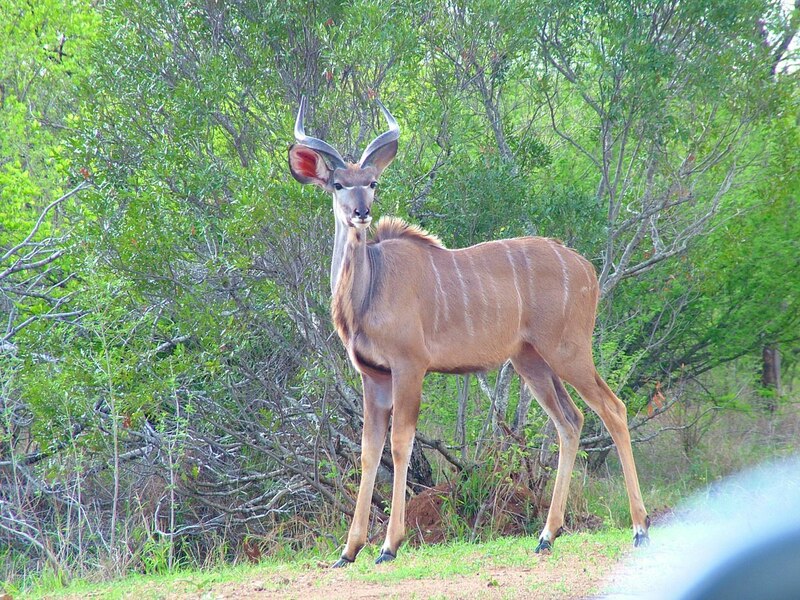 Not knowing what to expect, we were hugely impressed when we rounded a bend and found this statuesque Greater Kudu lingering at roadside. Next up was a bit of grassland dotted with numerous Impalas, and even though we were a little pressed for time to arrive at Skukuza Camp before the gates closed, we pulled to a stop to photograph our first notable wildlife sightings. We were glad of the late afternoon hour when many of the animals come out to forage. 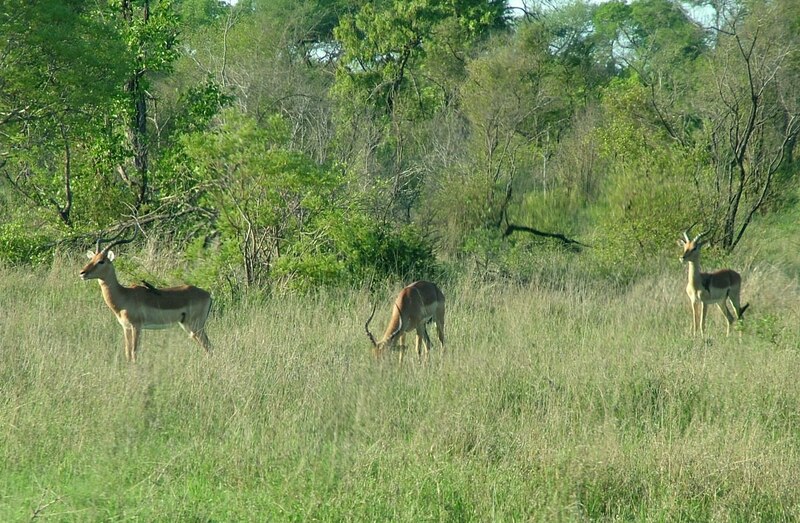 After coming across several groupings of Impala, Bob and I soon realized that they probably were the most commonly observed mammals in the Park. 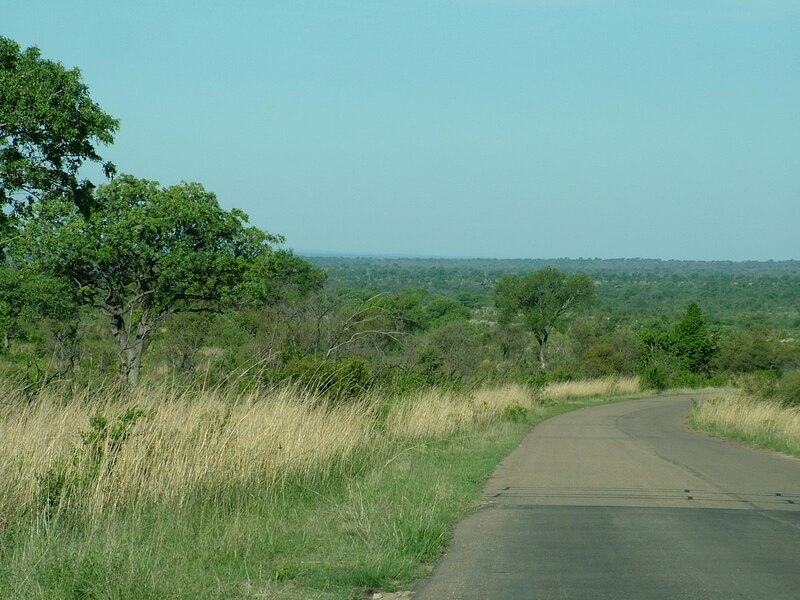 and then when a much-hoped for sighting of some African Bush Elephants happened a few kilometres further down the road, we could not believe our luck. When seen out on the veldt, the sheer bulk of these behemoths was staggering. The experience was most moving. Bob and I had high expectations for seeing many species of mammals during our four days at Kruger but had never given thought to what other creatures might be of interest. 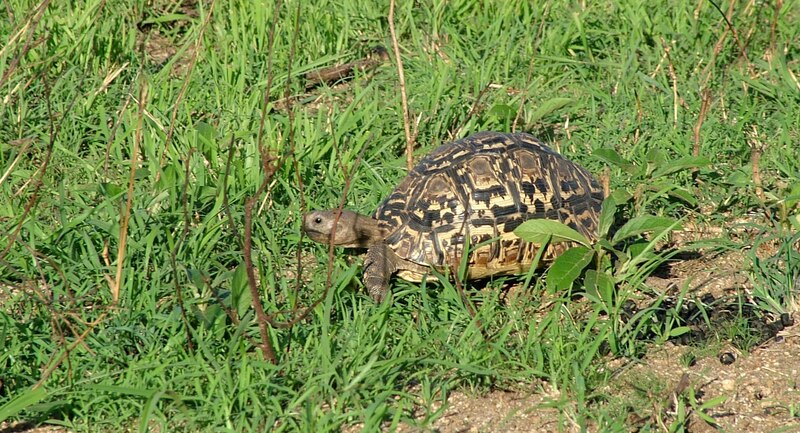 The unexpected observation of an African Leopard Tortoise that was just making its way off the tarmac gave us pause to rethink all of the possibilities offered by this marvelous game reserve. 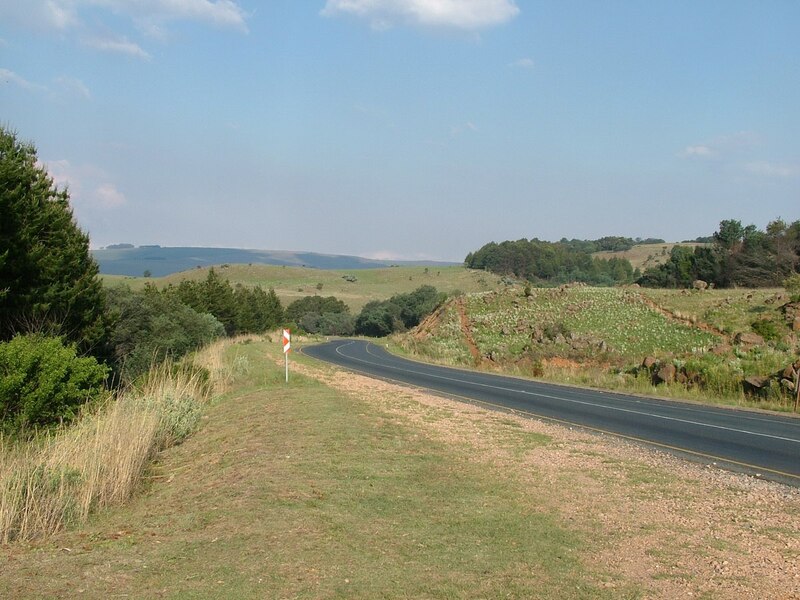 I was still feeling quite ill as we pulled through the gates of Skukuza Rest Camp, but I was confident that, by following the regimen of medication that Bob had brought with us, I would be feeling right as rain by the next day. 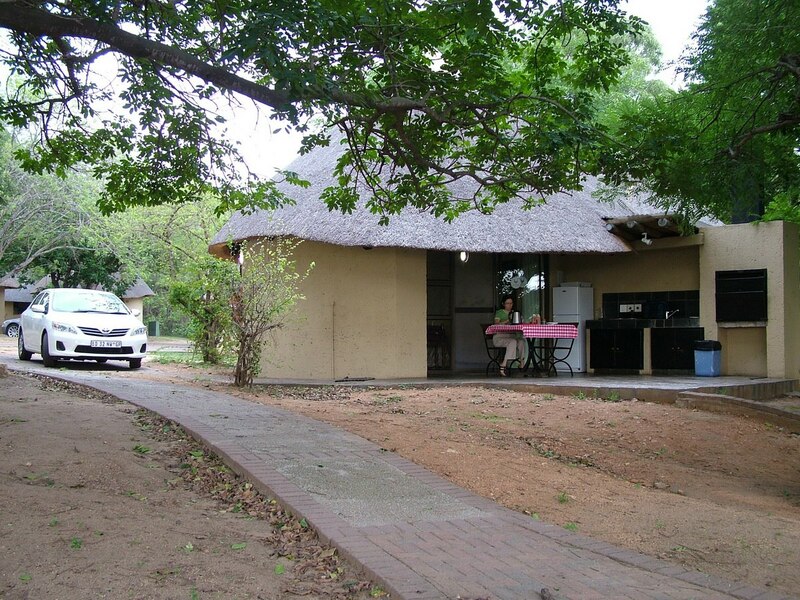 It was so much fun to pull up to one of the rondavels that would be our home for the duration of our stay in Kruger. 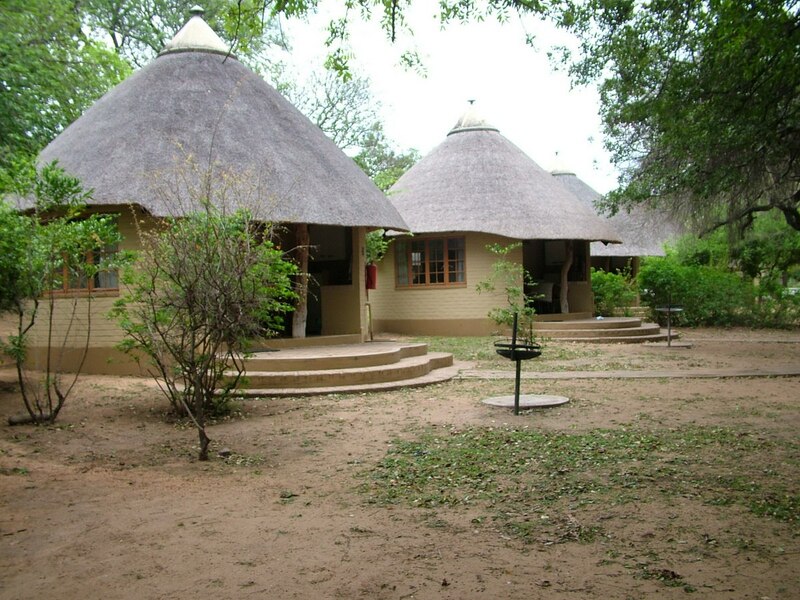 They are westernized versions of the traditional stone or mud and thatch huts lived in by native people in South Africa. 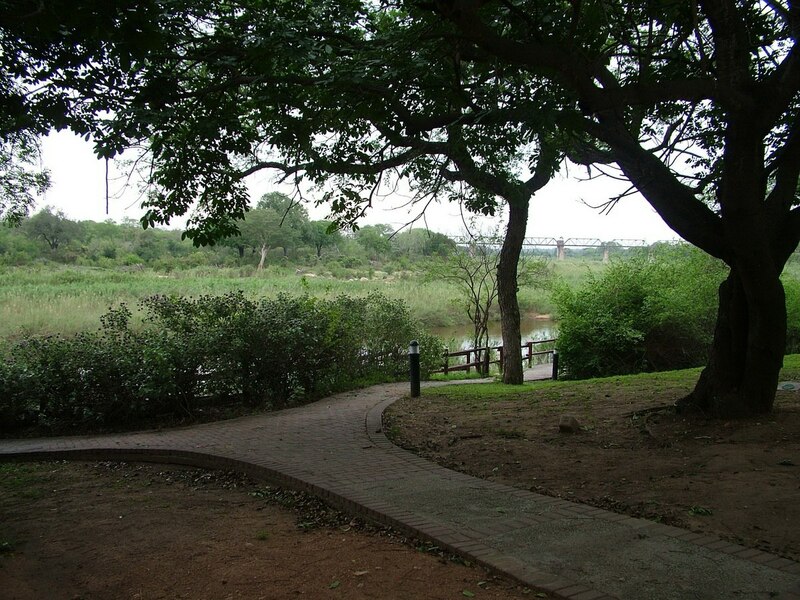 and before too long, Bob and I strolled along the tidy paths to gain a closer view of the waterway. That is when we became aware of the electric fence running all along the periphery of the compound between the dwellings and the river. Electrical wire also tops all the high fences that protect the Rest Camp from the wildlife that inhabit the surrounding vastness of the Park terrain. 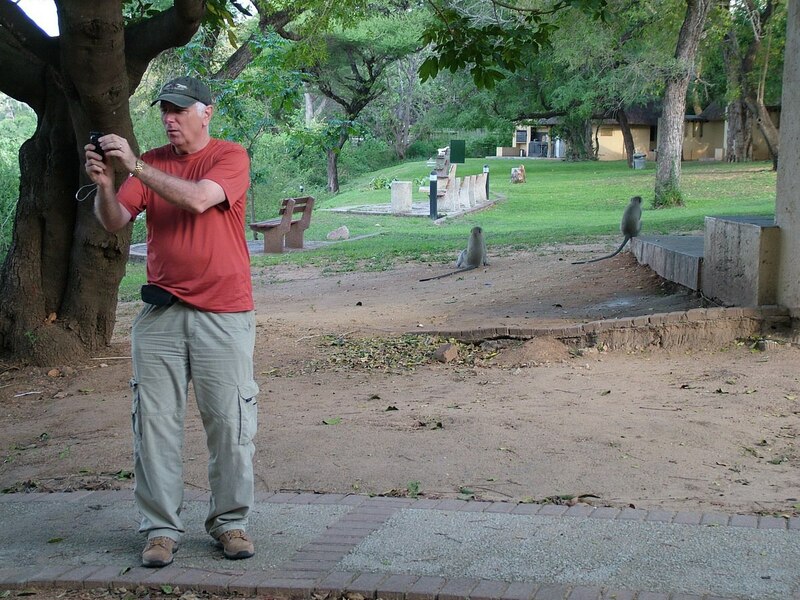 A more in-depth look about the interior of Skukuza Camp saw Bob and me walking to the main pavilion where a general store and couple of different eateries were located. 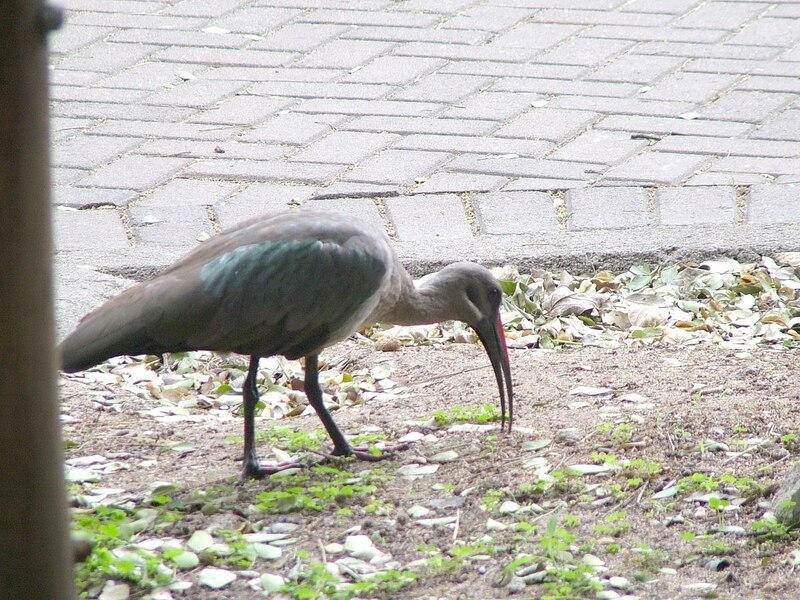 Even there, the sight of a Hadeda Ibis gave us great pleasure, but we were in for a big surprise when we walked back to our lodgings. and they were everywhere we turned. 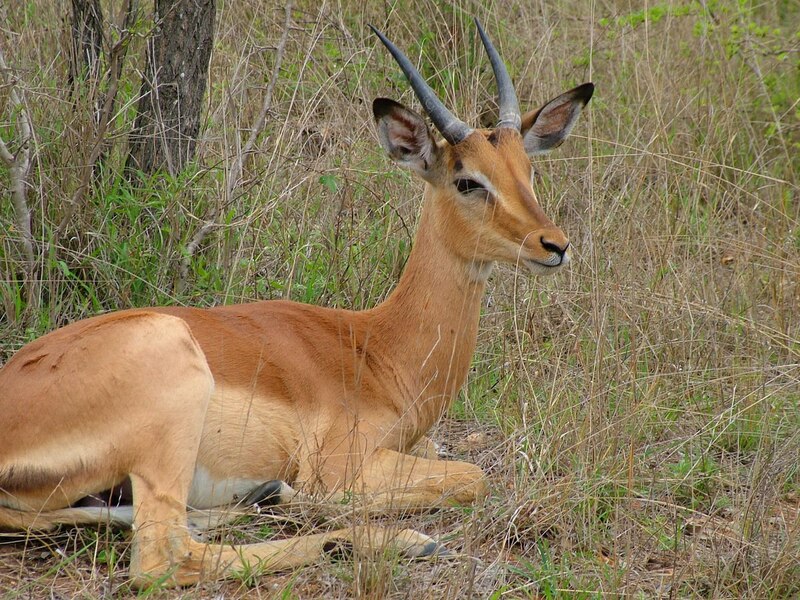 I wallowed in bed all evening, feeling decrepit, so Bob called the 24-hour doctor at Kruger National Park to acquire advice and double-check our own arsenal of drugs. Thankfully, by 9:30 p.m., I felt well enough to soak up the balmy temps while stationed on the patio to write my daily diary. Myriad birds heralded the rising sun, but Bob and I did not roll out of bed until 5:30 a.m. despite people stirring in neighboring huts for the previous hour. A few stray rays of sunshine peaking around the curtains enticed us to rise and greet the day, and the slowly vanishing nighttime chill helped to prod us into a state of awareness. 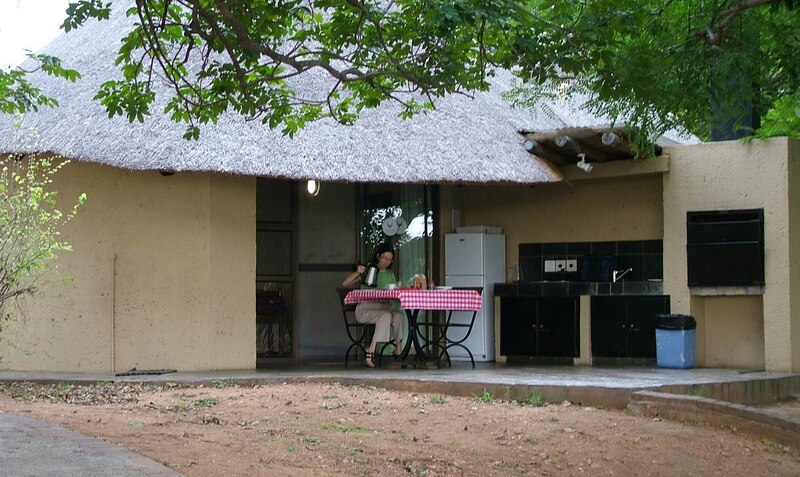 The rondavel was of simple construction, and to keep the heat outdoors, all cooking facilities are located in the portico under the overhang of the roof. 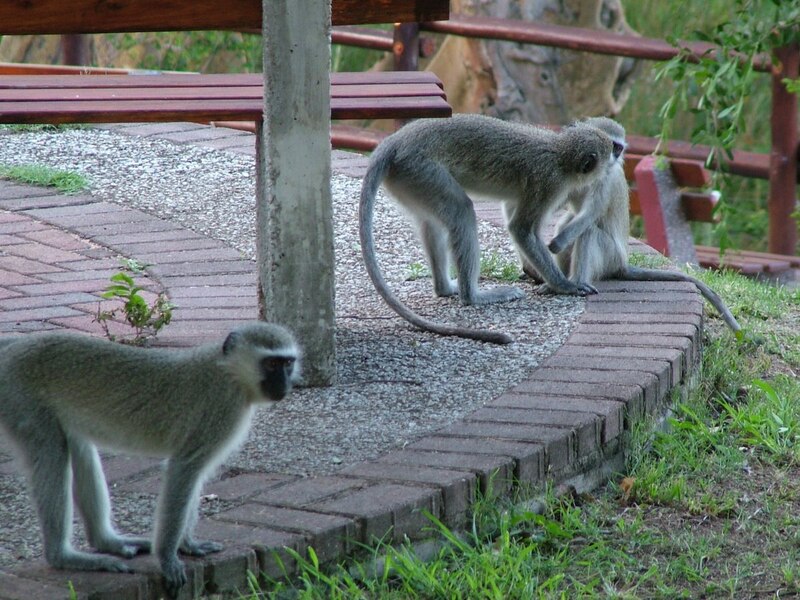 Once again, to keep the creative Vervet Monkeys from pilfering food, we had to jam a chair against the fridge door before leaving the area. 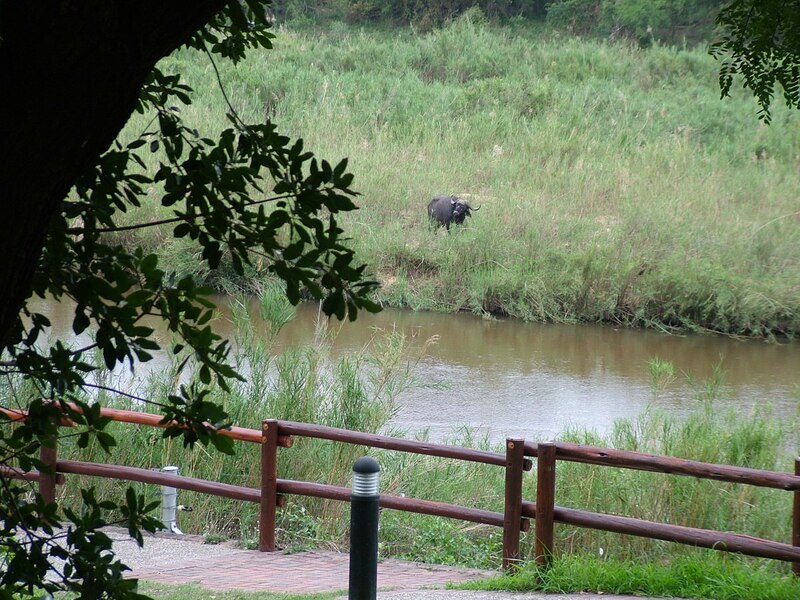 We deemed that it had been well worth the higher cost paid for accommodation with a riverside view because even our first look across the water revealed an African Buffalo. It meandered through the tall grass growing on the riverbank leading our eyes further downstream where we identified 3 more basking on a sandy point. 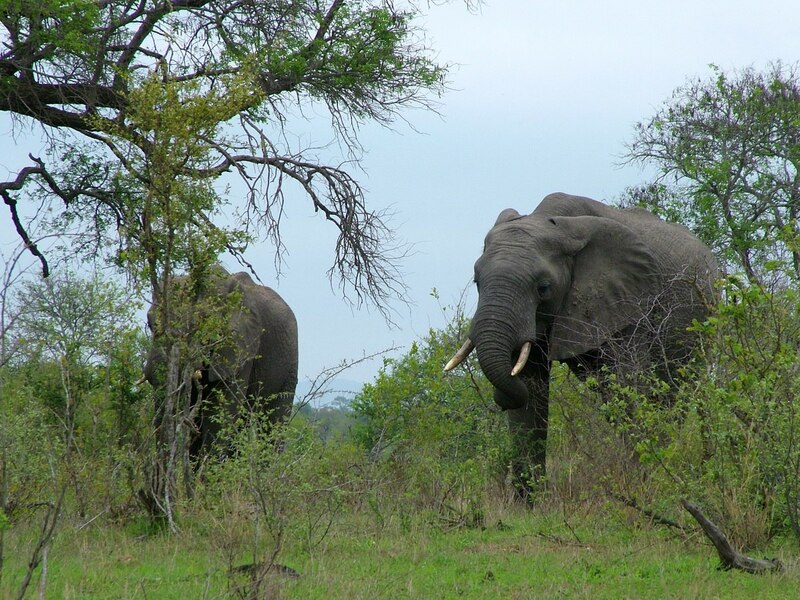 Kruger National Park is rich with wildlife across its 7,580 square miles (19,632 sq. km.) 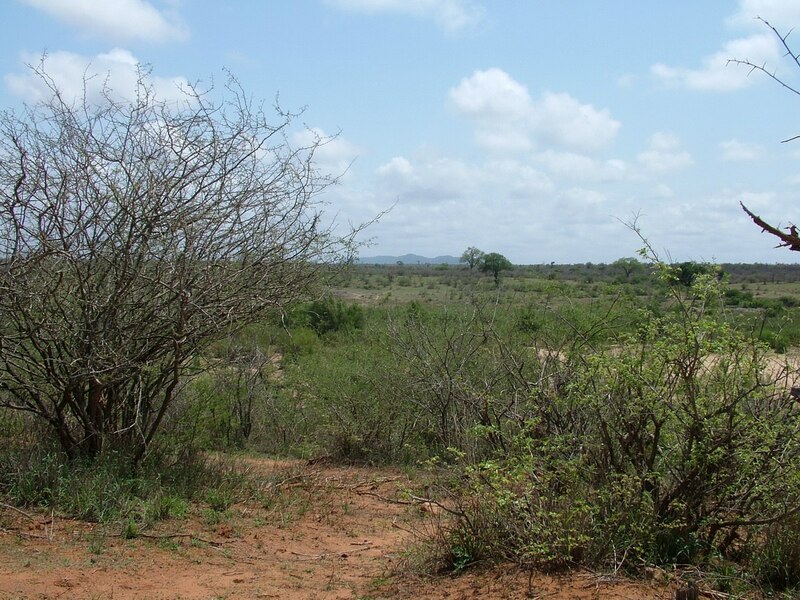 of protected savanna, dry woodlands and grasslands. 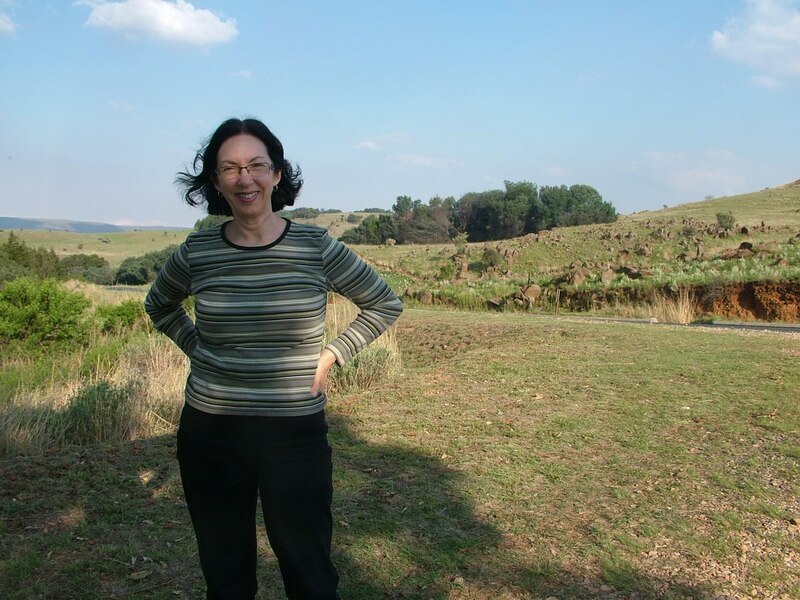 Our objective for the first day was a self-guided safari in the hopes of uncovering some of the mystery and mystique of South Africa’s well-known game reserve. We were rewarded amply for our time spent touring on a few of the many roads in the Park. By 3:30 p.m. that afternoon, we retired to our patio once again and relished the view of the river the fronts the whole breadth of the “village”. 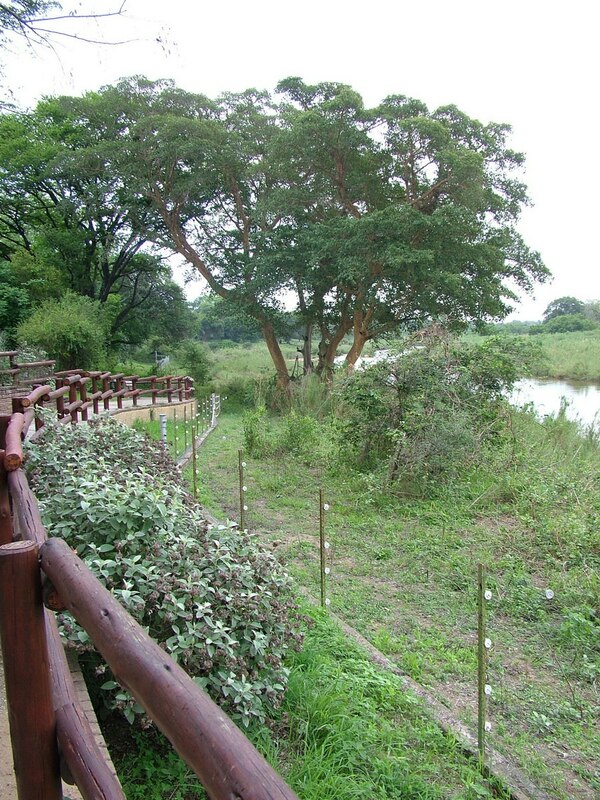 At dusk, a young boy walking along the path at riverside drew our attention to two hyenas skulking next to the electric fence. It was sobering to think that only a few strands of electrical wire kept the hyenas at bay. 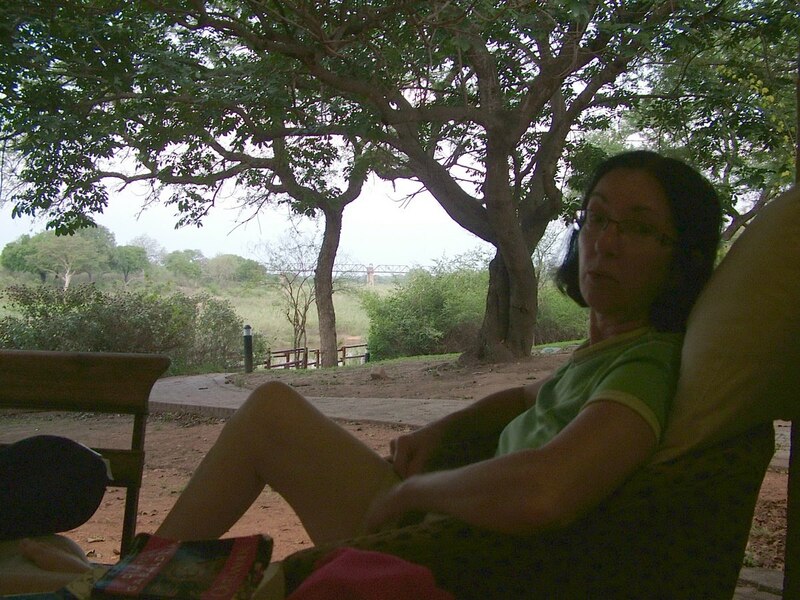 What gave us a real fright was when the power in Skukuza Camp went out for a good couple of hours that evening. We were prowling the grounds but retreated to our rondavel quickly when the whole compound was plunged into absolute darkness. 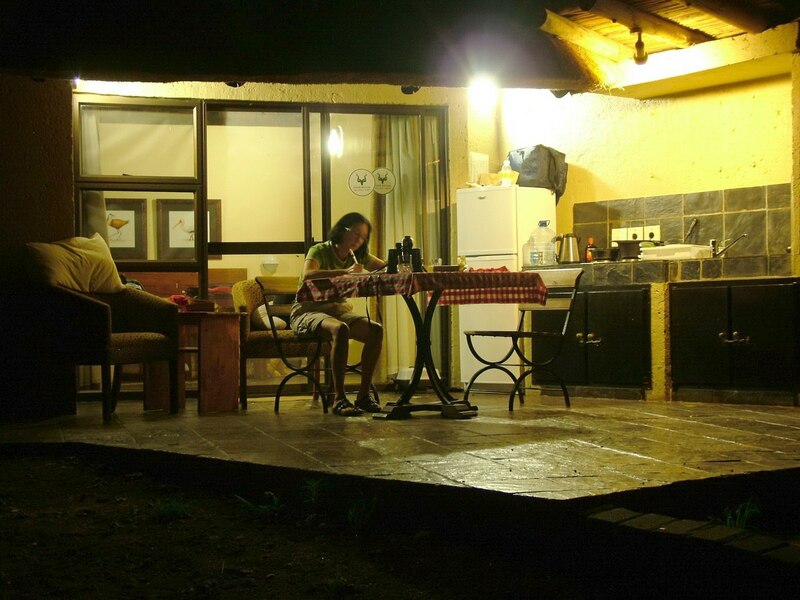 Enveloped in haunting bird calls and the constant hum of insects, Skukuza Rest Camp became vulnerable to intrusion by any number of predators. The whole situation reminded us eerily of Jurassic Park. We retired early that night and made sure to lock all the doors and windows.